An affordable, automatic bench-top decapper for elimination of repetitive stress injury and exposure to aerosols. Automated bench top decapper for analyzer racks. Handles up to 15 racks in and out. Handles all standard vacuum collection tubes. Please view list of racks available below. To watch the Pluggo RH in action, please click on the rack desired. Automated bench top decapper for analyzer racks. Handles a Single rack at a time, with room to stage additional racks. Handles all standard vacuum collection tubes. Available for racks shown below in addition to the Roche and Beckman AU racks. The PLUGGO™ decapper is an automated system for the safe removal of original stoppers from vacuum tubes. Carousel based automated bench top decapper. Handles all standard vacuum collection tubes. Preventing the risk of infection through aerosol formation and accidental spillage of blood is now a major safety concern in all laboratories, particularly during the removal of the original stoppers from vacuum blood collection tubes. 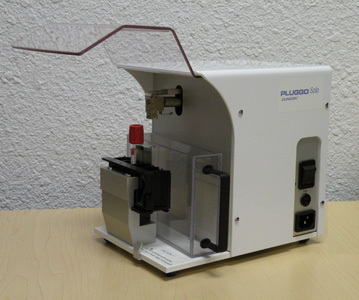 An automated bench top decapper for a single tube. Handles all standard vacuum collection tubes.